I don’t know about you, but I can get stuck in a salad rut! The normal lettuce, tomato, cucumber thing or my old favourites. Boring! I have been on the hunt for some super-healthy but also super-yummy salad recipes now that the weather is far too hot to cook. This is what I have discovered. Finely slice radishes. Quarter and core the apples and slice finely. Add all these to a bowl with the rest of the ingredients, except for the sesame seeds. Toss together, and season to taste. 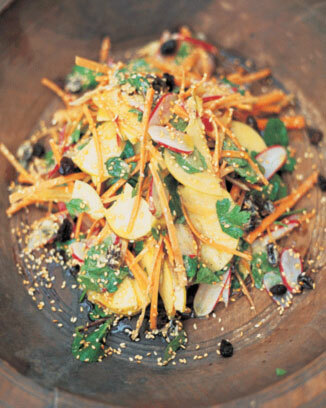 Serve with sesame seeds sprinkled on top and eat straight away before the salad loses its crunch. 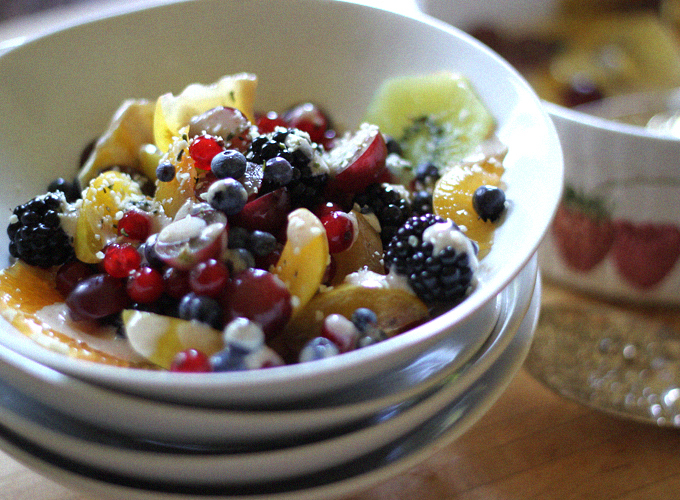 Chakra Fruit Salad with Enlightened Tahini Sauce from My New Roots. Do you have a super salad recipe? Please share or link us up with your favourite one! I know! I have no clue how people hate veges – they are amazing! Oh Sonia – You read my mind! We have been having salads the past three nights and looking to continue for weeks. I need to add to my repertoire, so this blog came at the perfect time. I too am in a salad rut and have been thinking of alternatives. So very timely blog. Great! 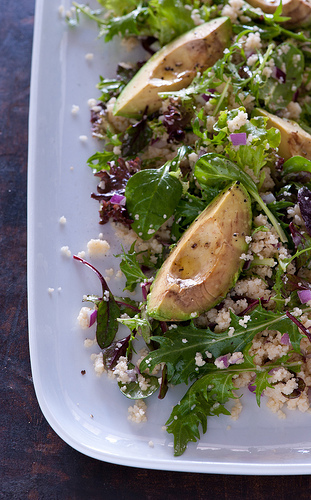 Hi, feel free to share these salads – the quinoa one is fantastic. Sorry, couldn’t work out how to put scanned recipe on blog. Thanks for the ideas! My new favourite salad is the Warm Chicken and Blue Cheese Salad from Meat on the Menu. Heaven! if you’re a blue cheese lover. Thanks so muck for this post, I love salads and these alternatives might just get the kids on board too as they are not into lettuce at all! I meant to write thanks so much! sorry! I make a variation of the carrot and beetroot one. The night before soak some sultanas in lemon juice then when serving mix in with the grated beetroot, put in a bowl and place the grated carrot as a ring around the top – just for looks as it gets mixed as you serve. These look yummo thank you. I can’t open the Moorish Jamie Oliver Recipe for some reason?? Oh my sisiter just said to me to make a NICE salad for xmas and then I see this your fantastic think these will be a winner let me know if you have any more! Yum all these look great! I make a delicious salad with roast pumpkin, baby spinach leaves, feta and pine nuts! One of my favourites! It’s a pleasure. Your rice salad is such a hit around here and it’s great for the lunchbox!